I decided to post a gallery of six photos to celebrate the longest day of the year — the Summer Solstice — and the coming of Summer. No story is attached, except I like these photos taken yesterday! Click on any one to enlarge it, and then scroll through them. For more photos without stories, visit Urbanwildness.com. Left Back Leg: New Injury or Old Injury Acting Up? She’s been limping for several days now. It was barely perceptible at first, and I questioned myself as to if it really was a limp. But now it has gotten worse — a definite limp. I’ve not yet trained myself to recognize, by the stride, if the injury is in a paw, wrist, knee, hip or shoulder — veterinarians apparently can do this. But even I can tell that it’s the back left leg because she holds it up regularly, not wanting to put her weight on it, and her gait is not smooth. It doesn’t seem to hamper her ability to move. I still see her climbing steep inclines and rocks — but it might be hampering her speed. And the injury might be the reason she keeps much further away from people and dogs, all the time lately. I wonder how much it hurts. I know it hurts because she’s holding it up. Pain serves a purpose — it tells her “don’t use this appendage”. Is this a new injury, or is it an old injury coming back to haunt its victim? Four years ago, this same coyote sustained a severe injury on her hind back left leg after being hit by a car, the same leg she is now holding up. That leg retains large black scars from that incident. Is this that injury acting up, or is it a new injury? No way to know. I’ll keep tabs on it. Anyway, life is short in the wild. Every injury or disease takes its toll. A coyote can live 14 years in captivity — but what a horrible worthless life that would be. In the wild, the average life expectancy of a coyote is about five years. Do we even know how long coyotes live in the urban wild? Many urban coyotes are killed by cars. 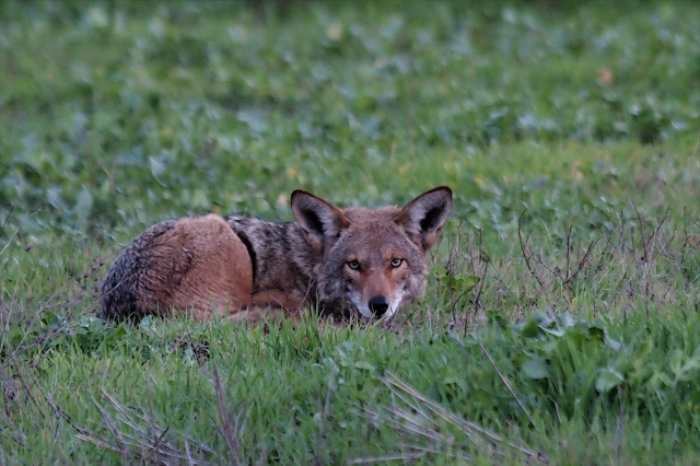 In some areas of the country, coyotes are trapped and killed in urban/suburban areas. Most coyotes everywhere endure all sorts of diseases and injuries. Whenever there is an injury, I think about it specifically and globally. It was dusk when coyotes headed out on their evening trek. They followed the street line at first. Coyotes, like the rest of us, take the path of least resistance. Within minutes, the one in front stopped short, stood very still and listened. Yep, although you could not see them, there were people talking ahead. Better change to a less conspicuous route. They took a path under a thicket, following the street line, but way in from the street, along the backside of houses and apartments — it was an overgrown green corridor never used by people. Soon they emerged from the overgrowth. The dim dusky light hid them well. Nonetheless, two cars stopped to observe, and commented to me excitedly. Everyone wanted them to be safe. One of the coyotes headed to the sidewalk and street curb, with the obvious intention of crossing the street. Four years ago, this very coyote was hit by a car and remained lame for over a month: she healed on her own. She learned from her experience and now plans her crossings carefully. She stood there, hidden on one side by trees and by a parked car. Cars, their headlights on, passed by pretty consistently. When there was no car in view, she used her ears to get a sense of how safe it was, and when a person walked by, she hid behind a tree and was not seen. She kept waiting as cars continued to come by. Obviously, in her experience, this would not be a good time to cross. She turned around and went up the hill and disappeared from my view instead of crossing the street. The camera has compensated for the dim light in these photos: in fact, the coyotes blended into the background and were difficult to see in the dark. These photos were taken as these two ended their evening trek together. He tries engaging in his natural breeding season drives. She does not want this — she has a need to discipline his eagerness. What is fascinating is that he is a large male. She is smaller than he is, but incredibly wiser and smarter. She adroitly whips him around and onto his back and totally dominates him, making him lie there, belly up, under her! She is skilled and she has an unmatched force of personality. When he attempts struggling she nips him firmly and she doesn’t let go of her position until he shows her he comprehends. She’s always been the alpha, and I guess she still is. This is all about powerful enticing odors — exuding and absorbing them. Attendant behaviors include edginess and short tempers. Odors are left anywhere, but especially on existing odors, such as where a dog has urinated. Odors are absorbed by wallowing in them and sniffing them. Behaviorally, there is a decisive tentativeness during this time of year as a male and female approach each other. When HE comes over to sniff her, his movements are slow and as inoffensive to her as possible. The minute she shows any signs of flinching, he stops dead-still and waits for her to finish her reaction. He reads every detail of her movements. He is totally accommodating and ever so careful not to annoy. For her part, she likes his presence — after all, she is walking with him. But she has let him know that he better watch himself — she appears ready to react to any misstep on his part. She rolls in his urine and allows his closeness — if he is careful. They read each other well. She’s been testy recently and he is absolutely walking on eggshells because of it. I’ve numbered and annotated the 32 slides to explain what is going on in each one. For several years I have been visiting a nearby field to watch two coyote parents whom I named Mom and Dad. 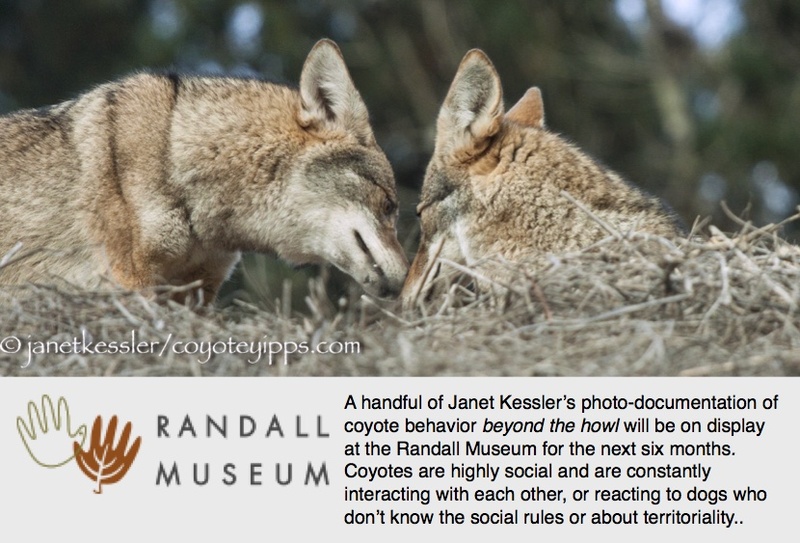 In November 2012 I found that a new coyote couple had replaced Mom and Dad as the field’s resident coyotes. I named them Rufous and Mary. Mary being a timid coyote, it has taken me a couple of months to get a close up photograph of her. Rufous isn’t timid and the video begins with him. After having repeatedly scraped dirt to territorially message my leashed dogs, the video begins with Rufous assessing his effect on us. At this point, Rufous expected us to have either run from him or chased him. Yet we hadn’t moved at all. He wants us to show him we got the message, to show him so by moving. To Rufous we seem really slow in delivering a reply via our feet. So what’s Rufous to do? Send the message again? Wait? The pause comes from my having constrained my dogs’ ability to communicate, restricted their ability to move. Motion is communication for canines and by now my dogs would have run away except for my influence. I resolved the uncertainty and tension by lobbing a golf ball toward Rufous. Rufous trots away. Note that a chain link fence separated us and that he was closer to us than a coyote should be allowed to approach, too close for me to just turn and walk away. I needed distance from Rufous in order to leave and he gave it to me when I asked him for it with a softly tossed golf ball. The video shows that to my dogs, Rufous ritualistically messaged his claim to both Mary and the den, communicated those claims in a way that any canine would understand. Deviation from canine expected motion, communication, came from my desire to spectate instead of move. Coyotes come into “season” once a year. This, unusually, is true of the males also. Females come into estrus in January. Coyote males produce sperm only at this time of year, and the process takes about two months. As happens with all critters, including humans, the hormones become powerful source of drives and behavior changes. Above are photos of a male showing a strong interest in a new odor. This is the kind of behavior you will see now. In addition, it appears that the hormones can cause an edginess around dogs — akin to PMS in humans!? If she’s in heat right now does she need to keep dogs away from herself? Other behaviors I’ve noticed recently include much more wandering and a lot more marking and scratching the ground. Below is a video of a female coyote reacting to an unleashed dog even though the dog is quite a distance away. The dog is barking threateningly at the coyote and then approaches. The coyote reacts by baring her teeth, raising her hackles, bouncing up and down and scratching the ground. 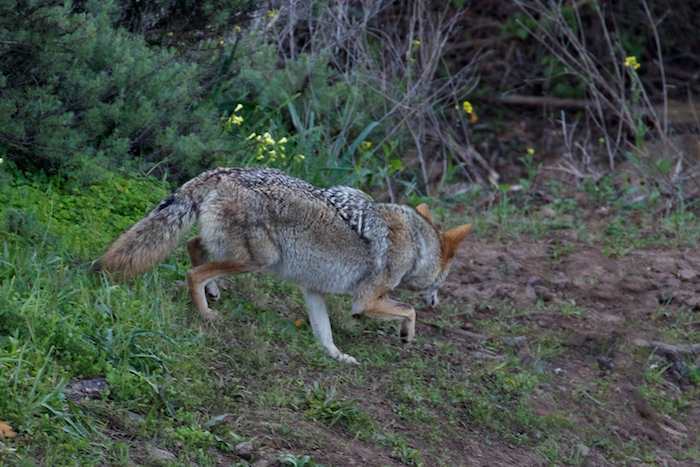 When the owner finally grabs his dog, the coyote runs angrily down the hill to watch them depart. You can tell she’s very upset at how she was treated by the intrusive dog, even though the dog, in this case, was a substantial distance away.